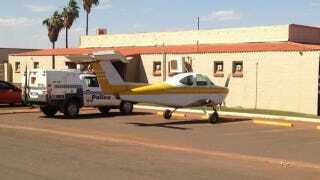 Australian Drives Plane To A Pub Because Why Not? A 37 year-old man from the West Australian town of Newman was hassled by police for taxiing a plane to a local bar and ordering drinks last Friday afternoon. However, the plane was not flyable, as it was missing its wings and reportedly lacked a yoke for steering. Bystanders said the plane was steered down the street with its propeller running and was steered using foot pedals (the rudder?). Even the police department is having some fun with this absurd incident, posting to their Twitter account that the best caption would receive a Mars bar and a tour of the police station. Police weren't sure what to reprimand the pilot/driver with, but settled on public endangerment. A bartender at the pub said the man was "playing dumb" while being questioned by the police. Police Sergeant Mark Mckenzie told Daily Mail Australia, "People could say it was funny, but one gust of wind or a circumstance where kids run out onto the road and it would have been very dangerous." The man was cheered on by pub patrons during his police questioning, and hasn't been officially charged with any crime. He has reportedly been dubbed a local legend in the aftermath of the event.